13 days till the Wonder Festival! Oooh! That means there is less than 2 weeks left!! 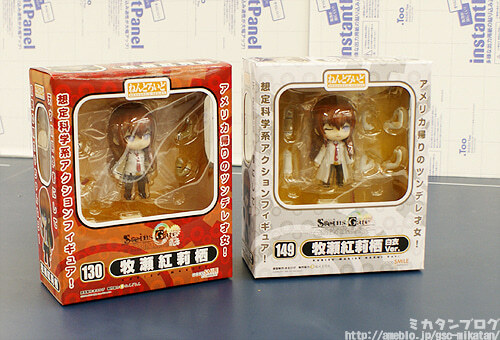 The Nendoroid on the left is actually the other standard version of Kurisu Makise, while the one on the right is the WonFes limited Kurisi Makise: White Coat Ver. Today we’ll be playing around with the White Coat Ver.! She follows the standard Nendoroid pack – she comes with two extra expressions, a number of arms and a couple of other little extras. Kurisu wearing her white coat! Kurisu comes from the SF adventure game Steins;Gate – in the game she often appeared wearing this white lab coat. This version also comes with different expressions to the normal Nendoroid! The other Kurisu is wearing her casual clothes! It creates a nice contrast when they are displayed with each other!! The stand is a sitting-type stand – you simply balance her coat to balance her. The inside of the coat has been made so that she can stand very stably. Extra parts – crossed arms! This is one pose that you just can’t go without when it comes to Kurisu. She is your typical tsundere character!! I’ve actually played through the PC version of Steins;Gate! It’s quite a mission to get ALL of the CG unlocked, but I’d definitely recommend it to anyone who hasn’t played it yet. It’ll make you laugh, cry and wish for more! She also comes with a Smiling Face! She also comes with bent arms for an adorable pose like this! Obviously you could replace one or the other with a different arm if you wanted to. When you use these parts her hair can get in the way on the right hand side, so there is an extra hair part to avoid the problem. As an ASCII art lover, this expression is perfect for me!! Otakana… excellent job in adding this expression in! I love it! For those of you who aren’t quite sure what the expression is… it’s the face she makes in the game when explaining about the brain’s hippocampus! Snow Miku wants to try it on! 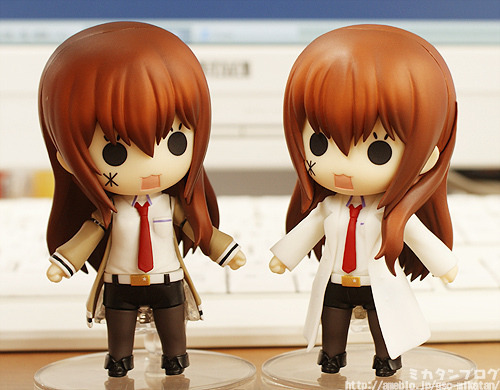 You can also give the expression to the standard version of Kurisu Makise! I’ll play with her more tomorrow! There are two ways to get your hands on her! They will be sold using numbered tickets at the event on the 6th February! More details will be available on the ‘Event Sales Page’ which will be available soon. Sales will start on 7th February 2011 from 0:00! For more details a ‘Web Sales Page’ will be put up soon! Just wait a little more! Unfortunately we do not ship these figures overseas! The site is updated regularly, so be sure to take a look now and then!